PPS Equity » Archive » Who Funded Pam Knowles’ Election? Great post! On a policy level for school board election reform what is the process? Who is in charge of listening to people who want this to change? I want to be fully informed before I speak on the issue but I enjoy writing and giving testimony. I will follow this story and if anyone wants to start working towards policy change on this issue count me in and when do we get started!!! If she really means the first statement it goes directly against the actions (not the words) of her core supporters. The second statement reflects her core supporters stated views. The point is that she was not so much supported for what she said as for who she is. 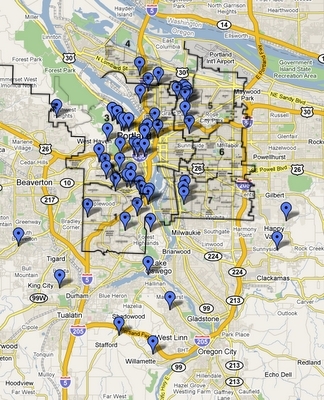 I can raise some nice contributions from my family to run for the school board, yet many don’t even live in Portland. Portland is still small enough that the movers and shakers know each other. They are not supporting candidates based on their platforms but on the relationships and “safeness” (did I just make that word up?) of their past actions. Will they go along with the program? Will they allow their organization or a person to retain his or her power? Do they know people who are involved with school politics who know this person? Etc. Etc. Then the word goes out. Interestingly Dan Ryan raised more than both Knowles and Bailey put together when he ran for the board. What the money allows you to do is reach the people who don’t pay any attention in mailings. I got one each from Knowles and Bailey. I got 3 or 4 from Ryan. Since their mailings were about equal the race was about who knows them, not who was voting for their platform or vision. Put either against a Dan Saltzman say, or a Nick Fish, and see the result. Wouldn’t make a bit of difference what either had to say. The task for people in the community on this blog is to hold Pam Knowles to the statements I listed. It is a key to getting the job done. I think Buel’s got it right. Pam’s list of big-name endorsers is hardly a who’s who of business figures: Barbara Roberts, Les AuCoin, SEIU, Rex Burkholder, Deborah Kafoury, Dan Saltzman, Vera Katz, Randy Leonard, etc. But it is a who’s who of Portland (and greater Oregon) movers and shakers, and thus trumps Bailey’s list of ed establishment supporters: PAT, Stand for Children, etc. I’m certainly willing to work with Pam to “even out the disparities in the district,” but I think Ken’s research here gives us reason to look into reforming the system of electing our school board. Thanks Steve R. for posting this. Sheila, I meant to acknowledge you for tipping me off to this article in the first place! Thank you! The system of voting we have now was put forth as a reform to replace the old running by position and district-wide voting. Options for running: by district, by position, or all together and the top 3 or 4 win. Options for who can run: Anyone district-wide or only by district. That’s about it. As I have said earlier the ESD has a combination of district and district-wide. You need a vote to change the system but how many people will vote to limit their vote? Now you can vote for the whole board — in districts you can only vote for one person, thereby limiting your vote. Not a very feasible solution for most people — less democracy. I still prefer the ESD combination, mostly because I think it is doable.